An island is a relatively small area of land that is completely surrounded by water. It is impossible to give a total number to the islands that exist on the surface of the planet. As a result of erosion or rising sea level, some islands drown over time. The longest surviving islands usually last no more than 5 to 10 million years (Earth is 4.5 billion years old). Ongoing volcanic activity continues to create new islands and to add to existing ones. On November 14, 1963, a underwater volcanic explosion off the southern coast of Iceland created the island of Surtsey, which continues to gain land as the ongoing lava flows cool. The eight largest islands on Earth are (in descending order): Greenland, New Guinea, Borneo, Madagascar, Baffin Island, Sumatra, Honshu (largest of the Japanese islands), and Great Britain. Islands can be divided into two types: continental or oceanic. Continental islands are parts of the continental shelves—the submerged, gradually sloping ledges of continents. These islands are formed in one of two ways: rising ocean waters either cover coastal areas, leaving only the summits of coastal highlands above water, or cut off a peninsula or similar piece of land jutting out from the mainland. Continental islands lie in shallow water, usually less than 600 feet (180 meters) deep. Greenland and Newfoundland (off the eastern coast of Canada) are examples of continental islands. A drop in sea level would be sufficient to connect these islands to the North American continent. Barrier islands: Long, thin, sandy stretches of land that lie in shallow waters parallel to a mainland coast. Continental shelves: Submerged, gradually sloping ledges of continents. Hot spot: Plumes of magma welling up from Earth's crust. Island arc: Curved row of islands of volcanic origin that develops where two plates converge, usually near the edge of a continent. Magma: Hot, liquid material that underlies areas of volcanic activity; magma at Earth's surface is called lava. Plate tectonics: Geological theory stating that Earth's crust is divided into a series of vast platelike sections that move as distinct masses over the planet's surface. Long, thin, sandy stretches of land that lie in shallow waters parallel to a mainland coast are called barrier islands. These are technically not continental islands since they are formed by the erosion of mainland rock (sand). The sand is carried to coastal areas by rivers and then carried offshore by strong waves and other ocean currents. tectonics, Earth's crust is divided into a series of vast platelike sections that move as distinct masses over the planet's surface. Most oceanic islands are formed as oceanic plates move over fixed hot spots (plumes of magma or lava welling up from the crust). Some oceanic islands are situated above the boundaries where oceanic plates converge or come together, while others arise where plates diverge or spread apart (a process called seafloor spreading). The Hawaiian-Emperor island chain in the north Pacific Ocean formed as a result of a plate moving over a thermal plume of magma from a fixed hot spot. The hot spot is believed to be causing the currently active volcanoes of Mauna Loa and Kilauea on the island of Hawaii. When two plates converge, the plate carrying the heavier crust dips under, or subducts, the plate carrying the lighter crust. At the point of subduction, a deep trench develops. Parallel to it, on the lighter plate, volcanic action produces a row of islands. These island groups are called island arcs, after their curved pattern. The Aleutian Islands, off the southwest coast of Alaska, are such islands. Islands often contain a strange mix of plants and animals. Because oceanic islands are isolated by their surrounding waters, they are home to only a few species of animals. Many of these animal species are found nowhere else on the planet. The small size of islands also prevents them from supporting a larger number of animal species. A few seabirds and insects exist in greater numbers since they are able to migrate over the waters separating islands. Plant life on islands is most abundant, as seeds are carried by winds, water currents, and birds from remote lands. 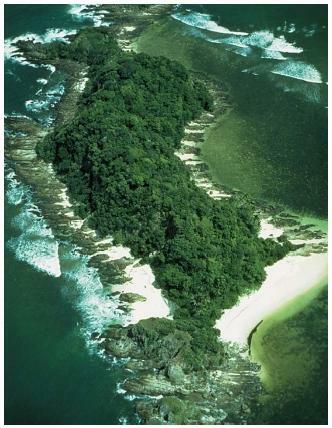 Island ecosystems (communities of plants, animals, and microorganisms) are delicate and balanced. Over time, they have reached a steady state—what is taken out of the environment is replaced. The relationship between predators and prey remain constant: those that die are replaced by newborns. The introduction of other life-forms into the closed system of an island, therefore, can have dramatic immediate effects. Changes brought about by humans is particularly devastating to islands. For example, domestic goats and rabbits introduced by human colonizers can completely rob a small island of succulent vegetation in less than a year. Dogs can turn every small mammal into prey. Such changes to an island's ecosystem can result in the extinction of animal or plant species, many of which are not even known. Scientists are increasingly concerned about raising awareness of the special features of islands and their contributions to geological and evolutionary knowledge. what are the types of continental and oceanic islands. Thanks a lot this essay helped me in my assignment. Do you by any chance have a real life example of an island?